Spain went in to this sporting their unorthodox 4-6-0 formation fielding a team without a recognized centre-forward. The ‘eyebrow raising’ formation had been introduced by Spain in this tournament and had been working to their success until now. The Italians on the other hand only made one change to their team that beat Germany 2-1 in the quarter-final which saw the rather unfortunate Balzaretti, who had a world beating performance lose his place to Abate. In the opening frames of the game both teams were working extremely hard to obtain command. Inevitably it was the Spanish, who once got their typical passing game going were always going to be hard to hinder. However, to Italy’s credit they were no push-overs and did not allow themselves to become besieged by Spain. They got frequent, although brief spells of possession and they looked to gain an advantage by pushing full-back Chielini high up the by-line and to get some deliveries in to Balotelli who displayed his areal potential against the Germans. 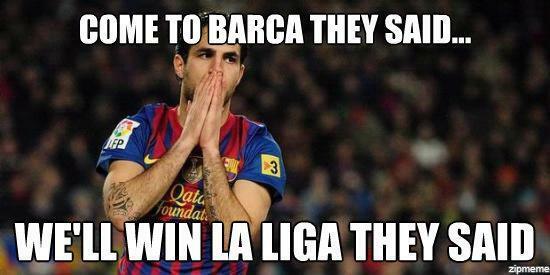 Where did it all go wrong for Barcelona? Graham Hunter wrote a book about them recently – Barça: The Making of The Greatest Team In The World. The Greatest Team In The World. Imagine that. Well that very team may well have been knocked out of the race for the La Liga title and the Champions League, all in the space of four days. All that’s left of their memory now is to wonder; how the hell did that happen? At one point not long ago, Real Madrid boasted an unbelievable ten point lead over Barcelona in the league table. Pep Guardiola described his chances of winning yet another title as “impossible”. Once Real came up against Málaga, who have found their feet in recent months, and a resurgent Villarreal who’ve been disappointing all season, in quick succession, all of a sudden four points were dropped. A couple of 5-1 wins later, and best-of-the-rest Valencia came to town. Is it really that time of year again? The time of year where Arsenal Football Club’s season collapses in front of the despairing eyes of their fans? In years gone you would have been seen as mad as a hatter had you even contemplated that an Arsenal team managed by Arsene Wenger would surrender on all fronts but nowadays it is an all too regular occurrence for Arsenal fans. The elimination from 3 of the 4 trophies they were challenging for in 2 weeks has their fans worrying that their long wait for a trophy may just be gathering more pace, when it seemed it was only a matter of time before it was ended. The despair was there for all to see in Wembley two Sundays ago, when Wojciech Sczesny and Laurent Koscielny made a monumental error (see video below) to keep Arsenal’s wait for silverware alive. Ten days earlier they had just beaten FC Barcelona 2-1 at the Emirates stadium but since that night in the Emirates nothing has gone right for the Gunners. They subsequently lost the second leg 3-1 to Barca at the Camp Nou and then capitulated to a very poor Manchester United second string in the FA cup quarter-final. In the space of 2 weeks they had went from challenging on four fronts to hanging on for dear life in the other. To top all of that off, numerous injuries to key players has not helped their season. Cesc Fabregas seems to be having his annual mid-season injury when Wenger needs him the most, Robin Van Persie’s brittle bones are of no value to anybody with the frequency that he gets injured and Theo Walcott has a long standing ankle injury that has him ruled out for the near future. By far the biggest concern of the manager has to be his goalkeeping department. Lukas Fabianski is out for the season with a shoulder injury, Vito Mannone is also ruled out for the long-term and their most recent number one Wojciech Sczesny ruptured a tendon in his finger during the first half at the Camp Nou last week and is out for the next month, leaving the Frenchman with only one fit goalkeeper, the unreliable Manuel Almunia. How will Wenger respond to this? He has responded by recruiting former Arsenal goalkeeper Jens Lehmann on a free transfer to help to give himself some much-needed cover. The veteran German international who is 41 left VFB Stuttgart at the end of last season to concentrate on family life, played 199 games for the North London club between 2003 and 2008 is a firm favourite with the Arsenal faithful. Whilst the move makes sense, surely it is a wake-up call to Wenger that he needs to invest in a top class goalkeeper in the summer. Whether he does or not remains to be seen. Arsenals run in towards the end of the season looks on favourably with that of Manchester United’s. They have trips away to London rivals Fulham and Spurs, and then home games against Liverpool and the crunch tie against Manchester United. The rest of their games look straight forward and they should take maximum points off the other games they have at home, especially when they have no other distractions compared to their other rivals for the league title. Personally, I think it is very unlikely that Arsenal will win the league this season. Despite getting knocked out 3 competitions in 2 weeks, I don’t believe that they have the mentality to be able to catch a very average Manchester United side at the top of the table. They have serious issues with the talent at their disposal as well as their mental state. That is currently the difference between the two sides at the moment. Mentality. Could it also be that Arsene Wenger and Arsenal could part company at the end of the season? His refusal to spend any cash that’s available could lead to the Frenchman’s downfall. 6 long fruitless years is a long wait for any top side to go without winning a trophy. Many would argue it’s too long, others may not. But with the supposed financial position that the club are in maybe a fresh approach would do them good? If money is pumped into the Arsenal team it will make them better with the other clubs stuttering around them, but has Arsene Wenger got the stomach for the fight or will the same old clichés keep coming back to haunt Arsenal for the foreseeable future?